These are: attributable material, provenanced to a single country property and, of course, inherent quality. Meeting those provisos at Bearnes Hampton & Littlewood (21% buyer’s premium) on October 9-10 was a set of eight George III dining chairs. 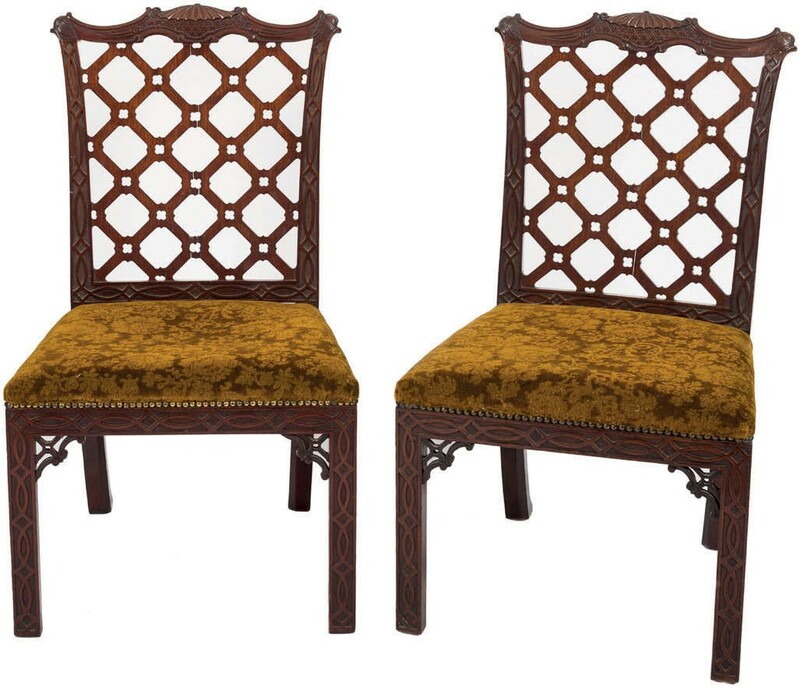 The carved mahogany trellis back chairs were consigned from Kingsnymton Park, Devon, which has supplied some fine pieces to the Exeter saleroom since the stately house and estate was bought by the Lichfield Trust in 2016. The chairs were attributed to Robert Manwaring, who described himself as a cabinet maker and is best known for his 1765 work The Cabinet and Chair-Makers Real Friend and Companion, a modest rival at the time to Chippendale’s 1754 Director. In fact, no fully documented Manwaring piece is known. The £30,000-50,000 estimate looked rather bullish in the current market. However, two years ago auctioneer Nic Saintey took £25,000 on a set of 12 Chinese Chippendale chairs made for Kingsnymton in 1754 by an Exeter cabinetmaker and the new consignment was in better condition. 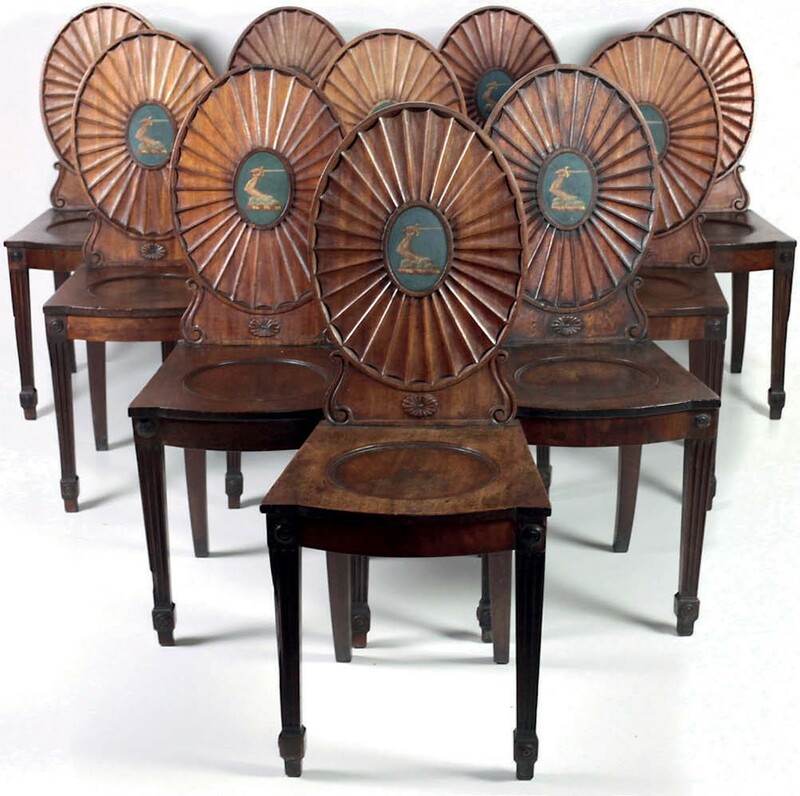 After the Manwaring chairs sold to the London trade on the lower-estimate £30,000, Saintey reflected that after buyer’s premium, VAT and some restoration bills, the chairs cost the buyer about £5000 each. Chairs with a stately home provenance were among the highlights at Fonsie Mealy (23% buyer’s premium inc VAT) in Castlecomer, Ireland, on October 9-10. A set of 10 Irish mahogany hall chairs featured a sunburst design to the shield backs and central ovals hand-painted with the armorial crest of the O’Briens of Dromoland Castle, County Clare. The property is the former home of the so-called ‘Armada Table’ sold at Dublin-based Adam’s in Drogheda last week (see page 11). Made for Dromoland, the chairs were removed at some point to another O’Brien home, Thomond House, whence they were consigned to the sale by a direct descendant of the family. Pitched at €10,000-15,000, the set sold at €19,000 (£16,720) to an Irish-American collector in the US. Another five-figure seller was a davenport. 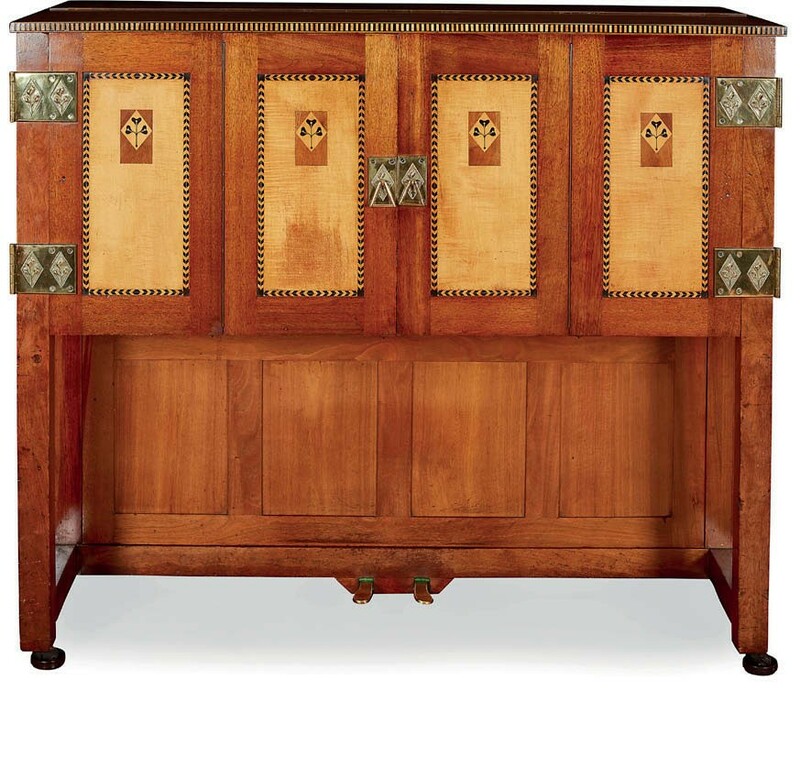 Not, of course, because it was a davenport – a piece of furniture no longer deemed fashionable – but because it was a fine example of the highly collectable marquetry work produced by Killarney craftsmen for upmarket 19th century tourists. Unusually large at 3ft 11in (1.18m) tall, and made from the arbutus strawberry tree, which flourishes in the Killarney valley, it featured the familiar vignettes of historic Irish buildings. The provenance could hardly have been better. It was made by a named craftsman, J Egan, for the 1864 exhibition at the Royal Dublin Society where it was bought by a direct ancestor of the vendor. It was estimated at €7000-9000 and sold to an Irish private buyer at €14,000 (£12,320). WAS Benson standard lamp – £3000 at Lyon & Turnbull. Offered at Lyon & Turnbull (25% buyer’s premium) on October 10, the 558-lot contents of Kirkton House, a Regency manse near Montrose, reflected the interests of the owners who spent 15 years furnishing it with British fine and decorative art of the late 19th-early 20th centuries. Among their enthusiasms was Pilkington Lancastrian lustre, 34 lots of which totalled just short of £90,000 against a top-estimate £57,000, largely fuelled by two superb stars. Illustrated and discussed in last week’s ATG (No 2363), one was the monumental 1909 vase, Apollo, by Gordon Forsyth which made a six-times-estimate £34,000 hammer. The other, a George & Dragon charger designed by Walter Crane and decorated by Richard Joyce, more than doubled top hopes, taking £32,000. Much of the Aesthetic and Arts & Crafts movement furniture at Kirkton House had been bought from widely respected veteran specialist Paul Reeves’ Kensington Church Street gallery (he now works out of Cirencester). Pitched at generally modest levels, well below retail, the pieces generally sold to private buyers considerably above pre-sale hopes. 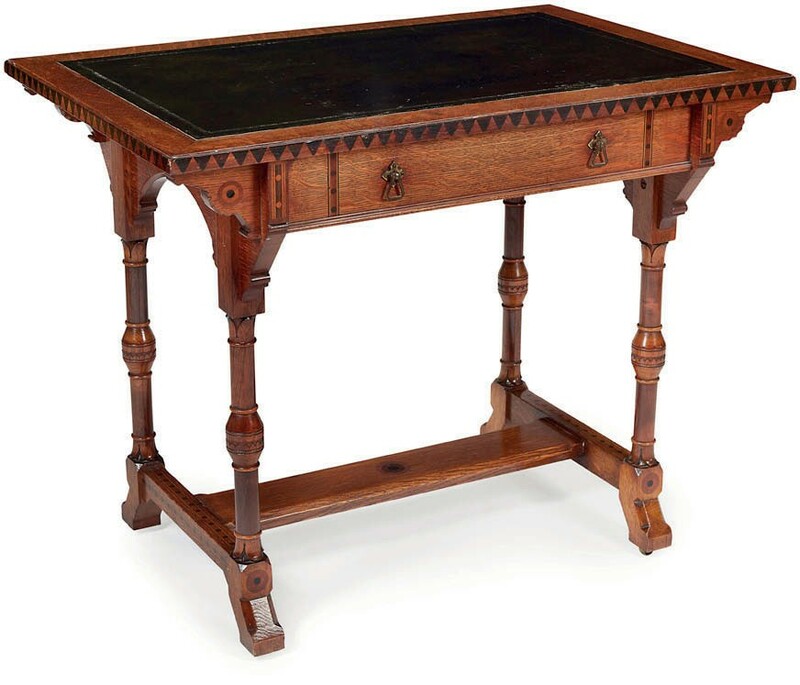 A 3ft (92cm) wide inlaid oak writing table in the Gothic revival style attributed to Charles Bevan c.1870 was estimated at £800-1200 but sold at £7400. Bevan’s life remains shadowy – he was born sometime in the late 1820s – but by the 1860s his name is mentioned with appreciation in a number of catalogues and periodicals. His High Holborn workshop made designs for Gillows, Holland & Sons, Lamb of Manchester and Marsh & Jones of Leeds. The stamp S&P/ B for Shapland & Petter of Barnstaple guarantees interest and did so at Edinburgh when it was seen to the locks of a c.1900 mahogany cabinet with mother-of-pearl and specimen woods marquetry inlay. Standing 4ft 4in tall and 2ft 3in wide (1.32m x 68cm) on barley-twist legs, it was estimated at £2000-3000 and made £4200. Charles Ashbee piano c.1907 – £7500 at Lyon & Turnbull. Among the best-known pieces in the L&T sale was a later version of the radically unconventional instrument that Charles Robert Ashbee designed for his pianist wife in 1900. Made by the Guild of Handicraft c.1907, this example was in walnut with stylish marquetry panels housing an upright mechanism by Strobmenger. Restored to full working order in 1999, the piano was pitched at £8000-12,000 but got away at £7500. Also to an Ashbee design, a pair of c.1900 oak side chairs with heart-pierced splats above drop-in seats and shaped square legs linked by stretchers more than quadrupled expectations, selling at £3400. Although he initially produced simple furniture sold by Morris & Co from c.1880, fellow Arts & Crafts titan WAS Benson became most famous for the lights produced by his electrical engineering factory in Hammersmith. Lighting at the manse included three very similar c.1900 brass and copper standard lamps to a typical design. Each estimated at £400-600, the lamps sold from between £2800-3000.